STOP! DO NOT SIGN a new build contract BEFORE YOU SEE THIS HOME in the BEAUTIFUL Resort Style Community of Gran Paradiso in The West Villages. Built in 2016, this popular PRINCETON FLOOR PLAN has an owner with impeccable taste. So many POST CONSTRUCTION UPGRADES that your senses will be thrilled. 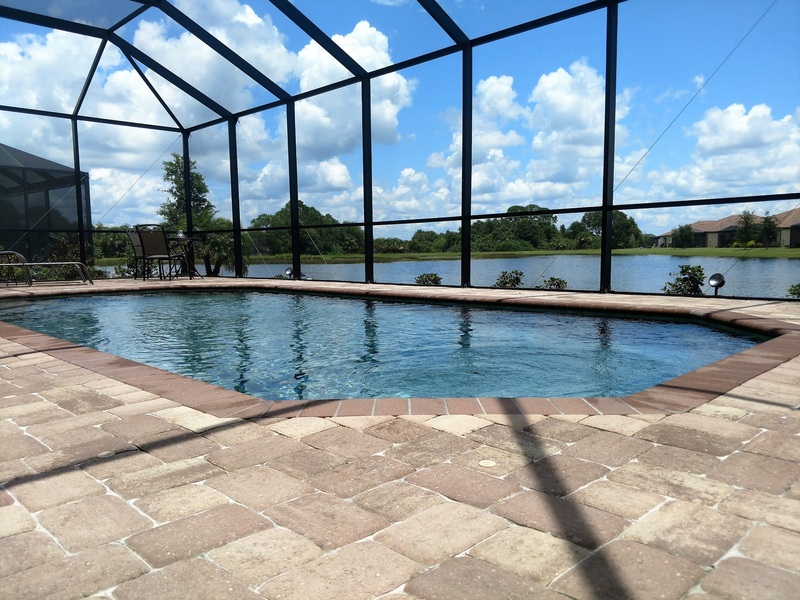 HEATED, SALTWATER POOL ON THE WATER with preserve views can be enjoyed from your new kitchen -with its beautiful custom backsplash, under cabinet lighting, double oven and pull out shelving. Hate toast crumbs on the counter or the sight of messy appliances? They even dreamed up a solution for that. An APEC 5 Stage WATER PURIFICATION SYSTEM and a new single under mount sink are definitely not your standard Lennar features. Extra task lighting and outlets in the kitchen and the master bath have been added for convenience and function. Additional touches of class include the handcrafted dining room chandelier and the beautiful Quoizel Laguna kitchen lighting fixtures from the Naturals collection - that feature a mosaic tile stripe which appears to be floating around a taupe mica shade. I love the Hunter Douglas Vertiglide shade on the triple slider -clean lined elegance. Need storage? The garage overhead storage racks with easy view and access are perfect. WAIT, we are still not done - this home has TOWN & COUNTRY LOCKING accordion HURRICANE SHUTTERS, insulated garage door, full gutter wrap, and RETRACTABLE FRONT SCREEN DOOR. The classic American Dream is to own a home, it's your personal dream to own this one. Click this link GranLago.MyFavoriteRealtors.com for more photos, open house schedule and the full listing details.